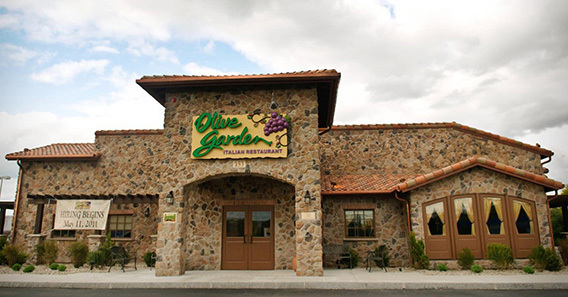 The Olive Garden serves Italian favorites in a dressy casual environment. The restaurant offers great ambience, excellent food, and outstanding service. Specialty menu items are inspired by the Culinary Institute of Tuscany, which is the Olive Garden's cooking school in Italy. Lunch menu items include antipasti appetizers, soups and salads, pizzas, chicken and seafood, and filled pastas. The dinner menu features appetizers, soups and salads, classic recipes, beef and pork, chicken, fish and seafood, pizzas, and filled pastas. The Olive Garden also offers specialty coffees and herbal and flavored hot teas.